Remote Viewing - My fear that one day it will be fully accepted by science as real. I have been what I call a Remote Viewer for eighteen years now and an intuitive all my life. My important breakout period happened from the age of twelve, so that’s now thirty two years of conscious intuitive experience. To me, through this experience and through my remote viewing work, participation and research I am left in no doubt to the reality of intuition across all living beings. We are all connected in this invisible force that permeates every nook and cranny of the universe, a force that binds us and guides us. 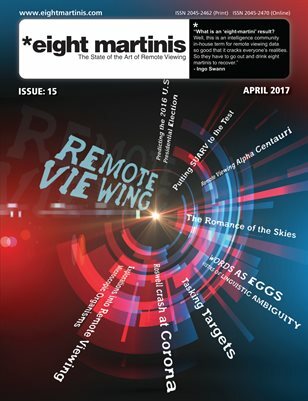 As part of my eighteen years researching, experimenting, discussion and reading books, articles and papers on the subject of remote viewing, the main aim, the main goal we all want as serious enthusiasts and researchers is for Intuition and remote viewing to be accepted and approved across the board, for science to finally and comprehensively recognise the reality of intuition within the makeup and lives of us all. Recently though I find my opinions changing, my wants wavering and I no longer want remote viewing to be accepted as real, proved in totality by science and to be fully accepted. Why? I hear you think, why such heretical thoughts, surely as a researcher and practitioner – you would want the best for remote viewing. To which I would answer ‘yes I do’, and this is why I don’t want remote viewing undoubtedly proven and universally accepted by all science, once and for all. Why? – Well this is because we just are not yet ready for this as a human race. We have all read and seen the explosion of information released over the last few years from whistle-blowers inside the worlds intelligence services. The depth and scale that organizations, corporations and governments, who are given power to preside and to ‘protect’ us, exceeds the ethical and moral values that should keep a balanced society in check. We literally cannot control ourselves with powerful tools. We seek to take advantage across all levels of society, we track people, we listen-in on them, we take away their rights, we even kidnap, interrogate and imprison people without charge, all based on what they make think, believe or potentially do in the future. Now, let’s play with my scenario for a second. Lets say for all intent here that remote viewing is suddenly fully explained, the processes that allow remote viewing and other intuitive abilities, suddenly forms out of the haze of theories and we have a solid working model. Within months Science fully and totally accepts remote viewing as a valid ‘thing’. I know what. Intel, Military and private corporations would funnel Billions into research on how to use this to advantages. Remote viewing and intuition would be militarised, and in the catch words of the Robert Redford hacking film ‘Sneakers’ ‘No more secrets’ would be at the forefront of this frantic development. Every intelligence agency across the globe would be on the search for gifted guinea-pig ‘participants’. Would this be voluntary participation? – who knows, but going on what we already know about how those with money and power work – would you trust them? Then there is the general public – how would they react? After all science has now proved remote viewing is real and it works, it gives an advantage. This now potentially makes all ‘normal’ people inferior doesn’t it? Aren’t they now second class citizens, wouldn’t they now go down on the list of job vacancies, demoted to menial or low wage jobs as those ‘gifted’ with intuitive skills are hired and promoted above them into key positions? If this did play -out, how long do you think it would take for the gifted ‘1%’ of the population to be sneered at, hated, and hunted by the 99% of the world’s population. How long do you think it would be before all ‘gifted’ would be under 24/7 surveillance, implanted with trackers, watched by an overwhelming population that would look at us with green eyed jealousy at the unfairness of the situation, seeking to address the balance. Knowing Humans and how we (so Far) work based on past and present actions – this would make it a very dangerous world for those practicing and gifted with intuition. Yes, a few of us may be lucky enough to find our way into a corporate program, paying obscene amounts of money to study, enhance, and use our skills, But we also have to be honest and with an influx of billions of dollars of investment, the research would be monetised, patented, kept secret and proprietary. Many of us will be hated by our friends and colleagues, maybe even though of as ‘unfair mutants’. And most of us would be tracked, traced, hunted and experimented-on. ‘Gifted’s’ would be tested and if found, would probably be banned from participating is parts of society where they are advantaged like sports betting, financial markets, corporate development and research, from justice systems – and much more, after all how could a guilty person get a fair hearing if an intuitive can access their thoughts for the ‘actual’ truth. Every part of society would change and I cannot find it within myself to see a path whereby we won’t abuse this. The military and Intel applications in a world or proved remote viewing capabilities is staggering. Every country, intel service, government, terrorist group would be hunting for and wanting to use the most gifted intuitives, and we know that some of these groups would not and do not take no for an answer. The real world 23 year Star Gate, military and Intel programs with their paltry $20 M funding with pale into insignificance when black project budgets and corporations would invest billions into development programs. It would be like a 21st century witch hunt, a ‘gifted gold rush’. Within all this you just know that individual rights would erode and not apply. After all, the really gifted are less than 1% of the total population, so are grossly outnumbered and it just wouldn’t be fair to let them dominate, excel both unchecked and uncontrolled. We already have documented stories and rumours of mass ‘recruitment’ drives within the former soviet republic in the 1970s-80s – intuitive being sought and ‘recruited’ tested on with experimental drugs and science as part of this initial psychic cold war that kick started the CIA’s recruitment at SRI (Stanford Research Institute) that itself birthed the modern remote Viewing program in the U.S. This scenario would play out globally. Very soon anyone ‘gifted’ would be tracked from birth, watched, and in some cases ‘developed or recruited’ for the greater good of the countries in which they reside. To become tools, weapons and devices used to infiltrate, spy, coerce and to gain an advantage – any advantage across all facets of society from military, intelligence, technology, financial and so on. I am sorry but however I play the scenarios out in my mind I don’t see a positive pathway for those with very gifted abilities in a ‘proven across all sciences’ scenario. As a race of beings we are just not spiritually developed enough to cope with a scenario of ‘gifted’ people being real without abusing this and the people. So no, I don’t want remote viewing to be fully accepted across all branches of science as real and factual – if fact I worry about the day that this happens.